Celery comes in two main types: traditional English trench celery and the newer self-blanching and American green, which produce a similar product, but would not have been acceptable for sale until recently, due to their bitter flavour. There is also leaf celery, often grown on the Continent as a flavouring and salad herb, and turnip rooted celery or celeriac, dealt with on separate pages. Celery was originally a marsh plant and requires an open site and very fertile, moisture retaining but well drained soil containing plenty of organic matter. Ideal pH is 6.6-6.8. For trench celery, prepare a trench in the autumn 30cm (12") deep and 40-45cm (15-18") wide, spacing trenches 10-12cm (4-5") apart. Work plenty of manure or compost into the soil in the trench and fill it to 8-10cm (3-4") below the surface, leaving the rest of the soil alongside to use for earthing up. Sow seeds thinly in trays on the surface at 50-60ªF (10-16ªC). Germination is slow: from 12-18 days, and germination rate is lower than for most other vegetables. Ensure seedlings are kept at a temperature above 50ªF (10ªC) for the first month, or mature plants will bolt prematurely. Sowing dates are early March in a heated propagator, or March and early April in a greenhouse or under cover. Sowing in modules is recommended, as transplant shock can also result in premature bolting. Prick out or thin as early as possible. Trench celery can be sown at 3 week intervals to extend the season for the more tender part of the crop. Harden plants off carefully before planting out after all danger of frost has passed at the end of May or in early June. 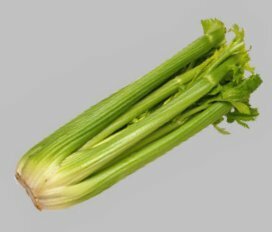 Self-blanching celery may be planted in frames in early to mid May. Reject plants with blistered leaves (celery fly). Plants are ready for transplanting when they have 5 or 6 true leaves. Non-trenching celery is planted 15cm each way (6"x6") in blocks, to assist blanching. Trench celery is planted either in the trench, 30-45cm (12-18") apart, or on the flat at the same spacing. Once plants are established, tuck straw around those on the outside of block-planted ('self-blanching') crops to assist blanching. To produce a good crop, celery needs regular watering, especially in dry weather; up to 4 gallons per sq yard per week. Mulching after watering is helpful. A topdressing or liquid feed can be applied about 4-6 weeks after transplanting. Start when plants are 30cm (1') high, around the end of July to mid August. Remove any suckers, loose, dead or decayed leaves. To blanch with collars use 15-22cm (9") strips of lightproof heavy paper or black plastic lined with paper to prevent sweating. On exposed sites, give each plant a cane, tying plant and paper to the stake. Tie the collar loosely with raffia, allowing space for the stems to expand as they grow. Further collars to extend the blanch can be added. To blanch in trenches tie the stems loosely just below the leaves, water the soil so it is just moist and draw the soil up about 8cm (3") around the stems (using a paper collar to keep soil out, if desired). Repeat every 3 weeks until only the tops are visible. Don't earth up higher than the base of the leaves and take care that no soil falls into the heart of the plants. Trench celery is hardier than the other types and matures in November to December. Once frosts are expected, protect the plants with bracken, straw or similar to keep them in good condition. Harvest trench types as required from November to February. Self-blanching, American green and leaf celery are not hardy and will only be available from about the end of July until frost. Celery fly is the most serious pest, causing blistering. Keep celery and parsnips separate (parsnips may also be affected). Grow crops under fine nets to avoid this pest. Slugs are very serious and should be tackled as soon as celery is planted out with a nematode drench. Leaf spot is seed-borne. Non-organic growers can use treated seeds, otherwise destroy affected plants as soon as you notice them (away from the compost heap) or spray with a permitted copper fungicide.